Compact chainsaws are often over looked by chainsaw enthusiasts which I find is such shame. Fortunately I’m not one of them and have presented the best small chainsaw reviews below. In my opinion, there are a lot of quality smaller chainsaws that get overlooked. So the aim of this article is to better inform and help you decide if a chainsaw of the smaller size is worth your time and money. But why buy a small chainsaw?. For starters they make a great side kick to your larger gas powered chainsaw. The second reason is because they are so handy. Perfect for smaller backyards with tighter areas to get in and around trees. 7 The Best Places To Buy Small Chain Saws? 8 Protective Gear And You! If you’re new to chainsaws, starting with something small is a good place to start. They are far less intimidating compared to larger units which is why they are a great beginners chainsaw. Even people who carve wood with a chainsaw professionally use a smaller saw with a larger saw, so they definitely have there place. Once you have decided you want to go with a small chainsaw, the next thing you will have to work out is what type. There are three types of chainsaws you can go with, which are gas, electric, and battery. They all have there own strengths and weaknesses as with everything. So finding the right one for your needs will really help narrow down, just which saw is best for you. 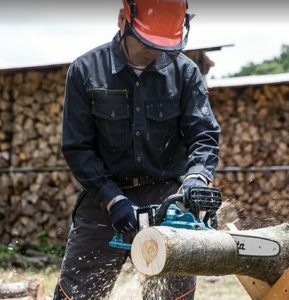 On this buyers guide I hope to be able to help you find the right small chainsaw for your needs, which hopefully makes your chores that little bit easier. In my opinion you can’t do a chainsaw buyers guide without including a Husqvarna saw. They are responsible for some of the most reliable saws on the market, thanks to decades of experience. That experience really shows in this 240 model, and is in my opinion the best small gas chainsaw currently on the market. For such a small saw it packs quite the punch. This is a pretty powerful saw for its size, while it won’t be replacing something like a Husky 455, it still holds it own. This is thanks to its 2 HP, 38.2cc engine and mixed with Huskies x-torque design makes it all the better. The x-torque design makes it a lot more fuel efficient, which means buying less gas, which means more money in the pocket. The thing that did impress me was how easy it was getting through 12 inch pine limbs, which I did roughly around 40 of them. One thing that I really like about this chainsaw is how it has vibration dampening. What this does is put the motor onto only one spring, which makes it vibrate a lot less. A really nice feature if you’re going to be using the saw for a long time. This really helps user fatigue, and a great thing for beginners who haven’t built up any tolerance for it. In terms of weight the saw weighs just a little over 11 or so pounds when you have everything including the 14 inch bar attached. This isn’t a very heavy saw which is great, and I have noticed a lot of women really like this saw for that reason. So if you’re a women looking for a good small chainsaw, or looking for a saw both you and your partner can use this is a good choice. The power of this small chainsaw is great, and something that really appeals to me. The combination of power and size make it absolutely amazing for backyards. I really liked how it was light enough for both man and women, having a saw both can use is a great quality. Also means neither are stuck waiting for the other to do the job. The vibration dampening is a nice feature that makes using the saw for longer periods much less of a hassle. Any quality of life improvement is a big plus in my eyes. While it doesn’t make the biggest difference I did appreciate the x-torque engine using less gas. I originally wasn’t a big fan of battery chainsaws, but over the years my opinion on them has changed dramatically. Especially since the introduction of lithium ion. That trend continues with this Black+Decker chainsaw, it’s a very reliable cordless chainsaw. It is powered by a 40V lithium ion battery which have a longer lifespan then your average batteries. I did find that they did takes a long time to charge, close to 5 hours. This is a pretty big negative to a lot of people, but I don’t mind it for this saw. Since you won’t be using it daily. The battery will last a variety of times depending on what you’re putting it through. It will only last 20 minutes if you’re putting it through its paces on something hard. But if you take it a bit easier and use it for what it is designed for, it will last a little over an hour. Maybe even longer if you’re really taking your time with it. Tho I would still consider the idea of picking up a second battery. It was powerful enough to get through some trees that were 12 inches in diameter, at there largest point. It did this quite easily which really impressed me. I did run it through some larger trees and it could do them, just not as easily and really drained the battery. So you can do that on the occasion and I wouldn’t recommend doing that all the time. One thing I did notice is that it is a very thirsty saw for oil on its 12 inch bar. This is a good and bad thing in my eyes. On one hand going through a lot of oil costs you more money, but on the other hand you know your bar and chain are well lubricated. Which is something you really want, so it’s a plus and a minus. While it is a thirsty saw, I really like the fact that it’s self lubricating. Not having to manually do it is a great quality of life improvement. I really like how it was able to get through 12 inch trees surprisingly easily, this is great for small jobs here and there. But can also handle some larger jobs. It does weigh a little bit more roughly around 12 to 13 pounds, so it is still light enough for most users. Electric chainsaws have come a long way since they were first introduced. 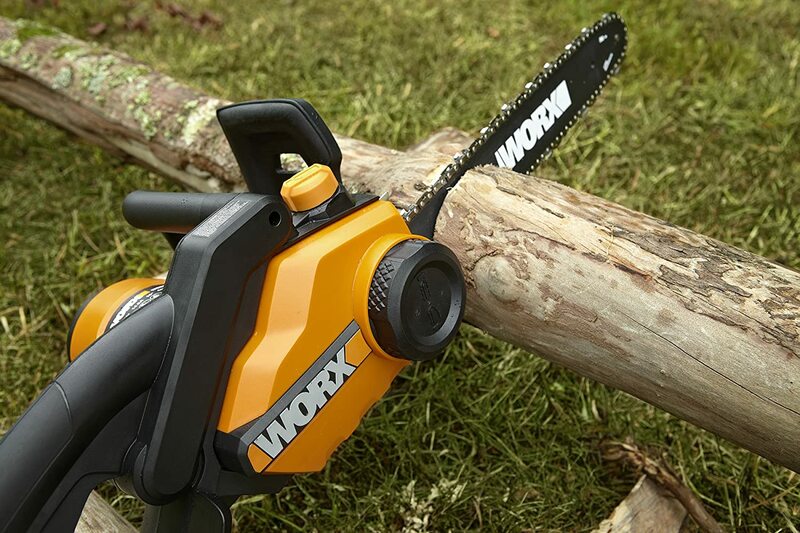 This Worx chainsaw is excellent proof in how far they have come, from terms of power and features. It has a 14.5amp electric motor which is really quiet and packs quite a punch for an electric saw. This is a chainsaw that I would highly recommend for first timers, and people who aren’t confident in there skills. It has a lot of features that improve your quality of life when cutting. The 14.5amp, 3 HP motor is very impressive, and really impressed me with what it could cut through. It was easily able to handle trees that were 12 inches in diameter, and some trees that were 14 inches in diameter. The ease it handled the 12 inches is what impressed me the most, it is one of the most reliable small electric chainsaws on the market in my opinion. The biggest selling point and one of the reasons I think this is a great saw for beginners, is the extra features it has. Which are its automatic oiling system, which makes life so much better when cutting. Then there is its auto tensioning system which is one of the most useful things for a beginner. I have met many people who have avoided chainsaws just from chain tensioning alone. It does weigh roughly 12 pounds which is about what all the saws on this list weigh. But this saw does have a slightly larger bard, coming in at 16 inches. With the larger bar does mean you can cut larger things, but it will come down to technique more then anything. As long as it isn’t a ridiculously hard wood. I really like the 14.5 amp electric motor, it’s very quiet and has a lot of power for a saw this size. The self lubricating and especially the automatic chain tension systems, are massive bonuses in my eyes. Anything to make cutting easier is a plus. Having the slightly larger bar was useful, when it came to cutting some larger things that you wouldn’t be able to get through with a smaller bar. This is something that is often overlooked when buying a chainsaw, or the benefits of it is overlooked. That is what brand you should choose when purchasing a chainsaw. 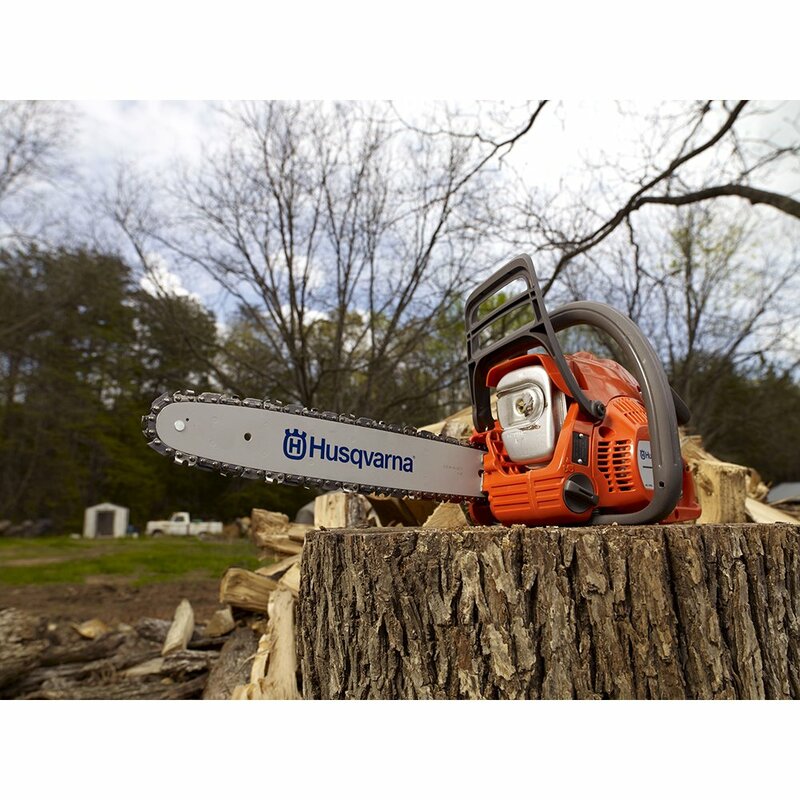 Going with a big name brand like Stihl or Husqvarna isn’t just about the quality of the saw. But when something goes wrong with your saw, which will eventually happen. You won’t be left in the cold like some brands will. This is because the bigger brands usually have either specialty stores or a contract with a local mechanic. So when your chain saw does break down you can usually take to one of these places and not ruin your warranty. But also you might not have to send your chainsaw away in the mail, so less rick of even more damage happening to it. While this isn’t the biggest thing in the chainsaw world, it is often something that I see get ignored or not mentioned. So I felt I had to put this here to inform, people who may not know, or even considered this. This is one of the most common questions that comes up when it comes to any sized chainsaw. This is normally a lot more of a complicated question when you’re talking about larger saws. But since smaller saws aren’t designed to handle the larger jobs, it does remove some of the issues of electric and battery, in terms of power. While gas are more powerful, the things you will be cutting are less likely need to have that extra power. So going smaller does actually help electric and battery powered chainsaws. 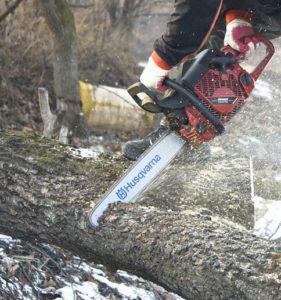 Gas type chainsaws are the most common types of saws on the market and for good reason. They have been the most powerful and reliable saws for decades. They have proven this time and time again, easily out classing electric and battery powered saws in the higher end. But when it comes to smaller saws more power is only a slight advantage. They will be able to cut quicker then there counterparts, which is nice. I find the best advantage to going with a smaller gas saw, is that you can put a larger bar on them. So if you plan on going larger, you can sometimes get away with just getting a larger bar. Instead of having to pay for another saw. So this can save you money in the long run. There aren’t a lot of disadvantages to gas saws, which is why they have dominated the chainsaw industry for years. The biggest issue is that they are a lot harder to start, and no matter how many saws you have used. You will come across a saw that is stubborn and make you doubt your abilities. If you have any form of shoulder issues I would highly recommend one of the other types. The next issue is mainly for beginners and that is the maintenance you will have to do on them. If you’re not the most mechanically minded person, this can be daunting and off putting. But once you learn how to do it. It really only becomes a minor inconvenience. The last thing is really a minor inconvenience and that is they are noisy. This can be an issue if you have neighbors close by, or live in a built up area. Tho ear muffs which you should be wearing anyway will solve it the noise issue for you. Electric chainsaws have a few really good advantages that I really like and will benefit most people. The first thing is that electrics are generally a lot cheaper then there gas and battery counterparts. This can be really useful if you’re on a budget and only need to use a saw once or twice a year. There is no need to spend a lot of money on a machine, if you’re only going to use a it a few times. The next biggest advantage of an electric saw is something that is very useful if you do have issues starting a gas chainsaw. They are super easy to start, so it is perfect for those who physically aren’t able to start a gas saw. Since they are so easy to start, it does make doing those chores a little easier. There are two smaller advantages that are worth mentioning, and they are how much quieter they are, and that have a lot less maintenance to do. Neither the biggest advantage but still useful. There is one glaring issue with an electric saw, and simply put you’re limited to how close a power outlet is. This isn’t a big issue if you’re only cutting in the backyard, and a 25 foot extension lead will reach what you need. It mainly becomes an issue if it is over 100 foot away, most electric saws are fine when using 100 feet of heavy gauge extension leads. The only other issue they have is they do lack power compared to a gas chainsaw. This isn’t as big of an issue with a smaller saw which is something I have mentioned a few times here, so I won’t go over it again. I like to think of battery powered saws as a nice middle ground between gas and electric. They remove the disadvantage of electric saws, by not needing an extension lead. They are also a lot easier to maintain compared to a gas machine. So if those are two concerns of yours, then battery is definitely a really good option to go with. There is something that is often overlooked with battery saws, and that is battery can be interchangeable. So if you have an interest in one particular brand like Makita, or Ryobi and already have some of there batteries. Then going with either of there chainsaws that use the same batteries can be really useful. Having spare batteries so you can rotate if you need to cut a lot that day, and you might be able to get just the saw itself. Which will take some of the cost out. While some would argue that a battery charge and needing to refuel your gas saw are the same issue, I don’t fully agree. Most people when using gas will have enough for what they plan on cutting, where I have noticed this isn’t the case for battery saws. So it is tough to say outright this is a disadvantage, but it is something you should think about. Having extra batteries does ease this in my opinion. The biggest disadvantage of a battery saw is the upfront cost of the saw. Generally you will be buying the chainsaw, charger, battery, and sometimes spare batteries. This can get very expensive very quickly, so if you’re on a budget this can be something that can really affect you. This can be the difference between a $200 saw and a $400 saw in some cases. The Best Places To Buy Small Chain Saws? This is something that I get asked a lot, and can be up to each individual with there preferences. But personally I prefer buying online from places like the Home Depot, or Amazon. There is no need to travel and waste gas, and no dealing with bad customer service. While I know not all are bad, but I’ve had way to many bad experiences. With people who don’t know as much as myself and only read a pamphlet. Where online there are hundreds of reviews by people who actually own the chainsaws. This is a personal preference for me but it is something I recommend, and generally the better option. While most big box stores will only have a few saws, online retailers will have a lot more options. A lot of “expert” saw users I have met (who are usually missing a finger or two) seem to think that you don’t need to wear safety gear when using a chainsaw. Myself and many others disagree, and I believe the more comfortable you are with something. The more likely you’re to make a mistake. This is because people get overconfident and sometimes just stop thinking and the next minute they have injured themselves or worse. So no matter how experienced you are, you should always wear some form of protective gear. Chainsaw chaps, or some form of cut resistant clothing is crucial when using a chainsaw. It is designed to bog down the chain so it stops cutting, and doesn’t cut into you. 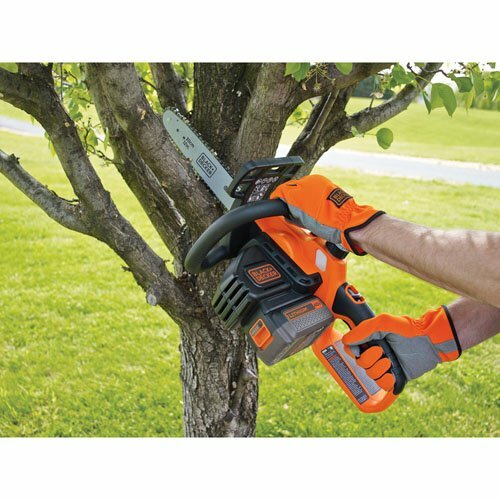 Leather gloves or non slip gloves are invaluable, the last thing you need when operating a chainsaw is slippery hands. A helmet is essential and even more so when you’re cutting above your head. You can opt for a full face mask which is ultimately better, but there are other alternatives. Steel cap boots are pretty self explanatory and great for protection. Ear muffs or plugs are something your ears will thank you for. Chainsaws are loud and you never know if a bit of debris will go in there and cause issues. The last thing is eye wear and this is 100% without question is necessary. The absolute last thing you need is something going into your eye, especially when it is so easily avoidable.